The Google Search Console, formerly known at Google Webmaster Tools, has added a more prominent help menu at the top of the page. If you login to your console, you will see the help menu at the top right, between the settings section and the drop down to select your sites. When you click on it, it adds a help box that you can drag around the page so it doesn't get in the way. 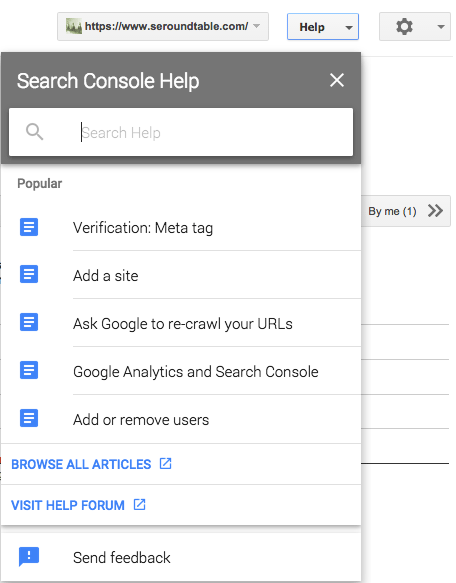 You can search for help articles or get contextual help based on the section you are within the search console. So the main area has help articles on how to verify your site, add a new site, add/remove users, etc. I suspect Google was noticing people had a hard time finding quick help here.